Fish Creek is a wild horse Herd Management Area (HMA) in the “heart of Nevada.” The herd of wild horses that live in the area are a living testament to the history of the land they occupy. Used by man to support our western expansion and successes in settling and cultivating the west, they represent in living form that journey. Wild horses are unique to all species of animal that occupy our ranges. These majestic beings walk in both man’s world and the untamed wilderness. This special place in history has left wild horses subject to every exploitation man is capable of. North America is the undisputed birthplace of the horse. Fossil records demonstrate clearly that the horse was born and evolved with this environment. Exploitation by early man was a likely cause for the demise of the species as they were hunted and eaten. Current research shows that horses crossed the Bering land bridge and gave their gifts to the world. In the US the most recent research is beginning to demonstrate that horses may never have gone extinct on this continent as early trade records with Asia and native human populations come to light. The federal government took jurisdiction over horses and burros that remained free roaming on public land. After the Act was passed wild horses were shot and mustanging continued during the “claiming period” from 1971-1976. Over 17,000 wild horses were “claimed” in the state of Nevada alone as “personal property.” This finally came to a halt when proof of ownership became a requirement mandated by Congress. Outrage by those in the ranching community and mustangers that profited from this practice continues to this day. Federal management of wild horses and burros is seen as further restrictions on what they truly believe is their exploitable personal property, public land and anything that lives or grows on it. For over 40 years the federal government managed wild horses in a “remove and warehouse” style that almost mimics that of mustanging. No integration of resource protection to preserve and protect a wild population, based on the needs of a wild population, has ever been accomplished. Instead wild horses were rounded up and the “make a buck” system shifted from slaughter to warehousing. Captured wild horses that did not fit age criteria were extensively documented. In addition to photographic records and DNA samples were taken and logged of each wild horse slated for return. Mares were given a temporary fertility control vaccine to slow population growth. “Julia,” a Fish Creek mare, at Broken Arrow. A hostage of Eureka County. 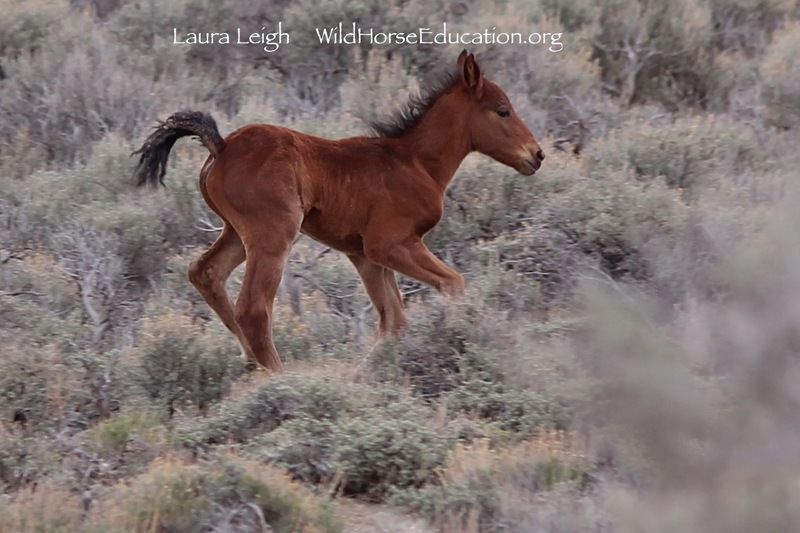 Wild Horse Education documented the wild horses sent into holding facilities. Included in that documentation was a trip to the Broken Arrow Facility (Indian Lakes in Fallon NV) http://wildhorseeducation.org/2015/03/08/broken-arrow-broken-heart/ This facility was part of a 4 year court battle engaged in by WHE to gain access to wild horses and their treatment by the BLM. 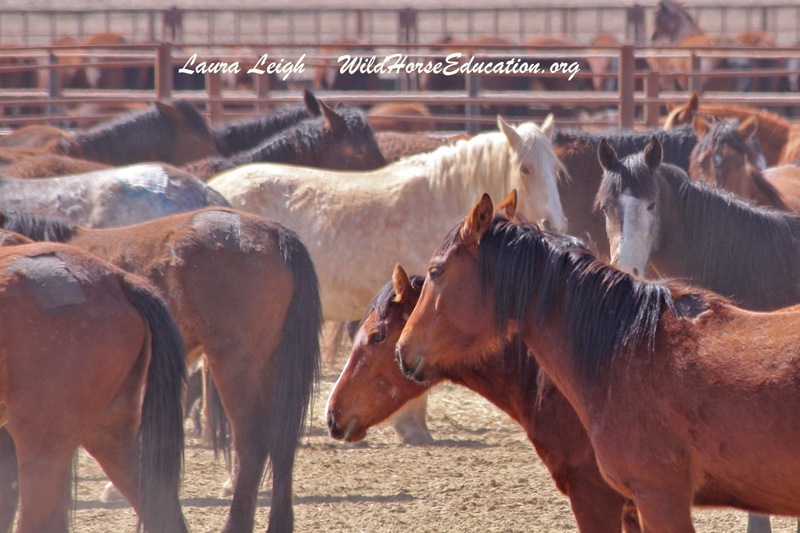 Part of an agreement with WHE President Laura Leigh was to open the facility to public tours including additional access if the facility was used to take in wild horses directly from the range. Ethel, a Fish Creek mare, on release day. Photo copyright Laura Leigh, all rights reserved. 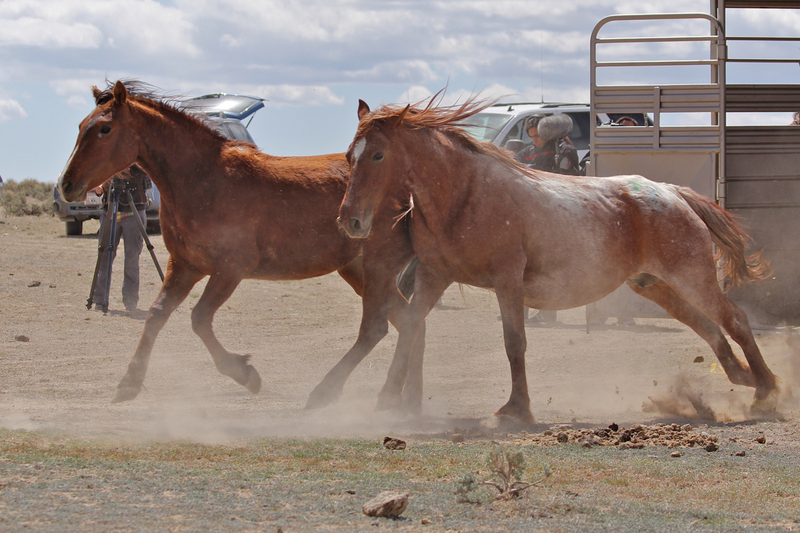 The fight to keep the wild horses from Fish Creek on the range is not over. Even though the IBLA denied ranchers standing in the underlying case to remove wild horses from Fish Creek they are allowing the case to move forward using the standing of Eureka county. The ruling that allowed the wild horses to be returned was recognition of BLM authority to carry out the initial steps of the plan. WHE is active in this fight and is preparing to file additional information. Propaganda is now being spread by a pro-slaughter organization that has joined with one of the ranchers. The rancher found in trespass last year (he has a 4 month permit to run livestock and ran them all year in various fashions) and was dismissed by the IBLA for not having standing to address the plan, appears to now have the support of Protect the Harvest. Protect the Harvest put out a series of propaganda videos last year (and pleas for donations) in support of the Nevada Association of Counties (NACO) action against the BLM to remove and even destroy wild horses statewide. The NACO action (we are Intervenors in that case as well) lost in federal district court and is now in Appeal in the Ninth Circuit. http://wildhorseeducation.org/2015/03/12/wild-horses-prevail-over-nevada-counties-suit/ Those of you that follow these issues closely will remember that Boyd Spratling (former co-chair of BLM’s Wild Horse and Burro Advisory Board and member of Nevada’s Department of Agriculture) was a participant in the films produced through Protect the Harvest and United Horseman (another non-profit organization run by Dave Duquette. That organization has one purpose, resumption of horse slaughter in the US). We are preparing to address the multiple attacks on this plan both legally and through media. A post focused on the extensive propaganda by the livestock community on drought, and against the Fish Creek operation, will be posted soon on our website. Our post release efforts to actually accomplish the goals set out in the management plan have begun. 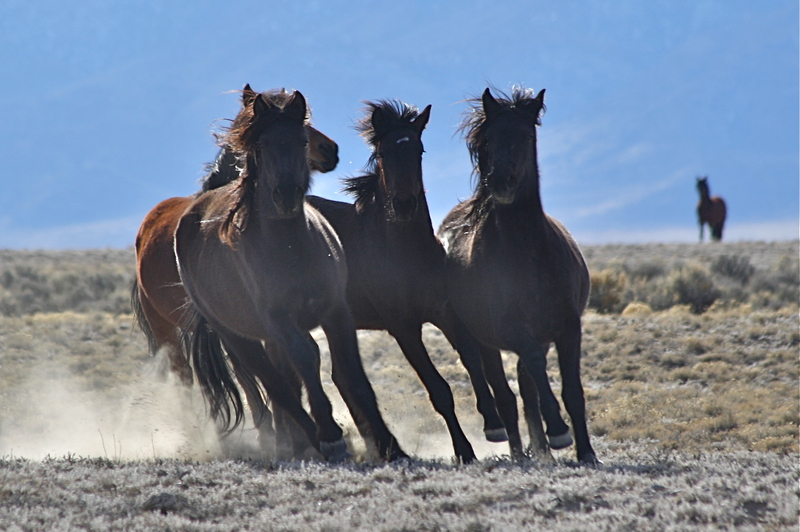 Data collection and compilation of information to protect the wild horses is underway. Extensive individualized information is being recorded that includes restructuring of bands, range utilization and herd distribution. Fish Creek is the largest area a project aimed at utilizing fertility control and creating extensive data tracking mechanisms is being attempted. A success at Fish Creek will point to a brighter future toward managing wild horses free on the range in a broad scale. The obstacles are many as we try to move management of wild horses into this century. However we are prepared to meet each challenge to the best of our ability.